Endologix Inc., a developer and marketer of innovative treatments for aortic disorders, announced today that it has received notice that the U.S. Food and Drug Administration has classified a voluntary recall action that Endologix took in July of this year as a Class I recall. Loyola Medicine neurologist Michael Schneck, MD, is a 2018 recipient of a Presidential Citation from the Neurocritical Care Society in recognition of his extraordinary efforts on behalf of the society. CERENOVUS, part of the Johnson & Johnson Medical Devices Companies, announced today that the first patients have been treated with the BRAVO Flow Diverter, following recent CE mark approval for the device to be used in the treatment of intracranial aneurysms. In his native Syria, Mahmoud spent months in captivity in a crowded room three floors underground, never seeing the sun. Disease spread quickly among the prisoners, he said. Food was scarce, often spoiled. CERENOVUS, part of the Johnson & Johnson Medical Devices Companies, announced today it has received European CE mark approval for its BRAVO Flow Diverter. 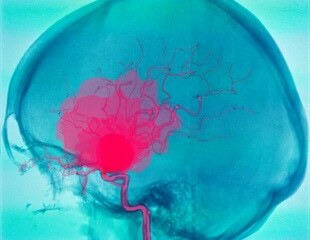 The device is approved for use in the treatment of patients suffering from intracranial aneurysms. Implantation of a stent-like flow diverter can offer one option for less invasive treatment of brain aneurysms – bulges in blood vessels – but the procedure requires frequent monitoring while the vessels heal.